JULIA: When a group of Capitol-area mystery fans first got together in 1989 to celebrate the traditional mystery, they pulled their name from this famous Shakespearian quote. Malice Domestic is an aptly named conference; one that celebrates the artfully loosened stair tread, the curiously dislodged stone off the manor roof, the cup of slightly bitter, almond-flavored tea. Happily, the nature of the conference makes it almost impossible to get lost in the crowd. First-timers are sucked into conversations about books and find themselves dragged along to lunch with seven or eight new best friends. Everyone else is greeted like a long-lost (and well-loved) relative. (One Malice fan told me the conference was like a family reunion, "Only better; I like my fellow fans better than most of my relations!" If you've been, you come home with books and stories and memories. Hallie? HALLIE: I've been to Malice two memorable times -- My memories moosh together, but I think there was a hat parade (I'm not making this up, am I?) and I remember the excitement that someone I knew (Roberta Isleib) was up for an Agatha! I was too much of a rube to know that I should go to the banquet. I met the nicest people ever, big names including Marcia Talley, and I was in awe. I remember sitting next to Dana Cameron signing books, and she had a line out the door. Every since, whenever Malice rolls around I wish I were going! 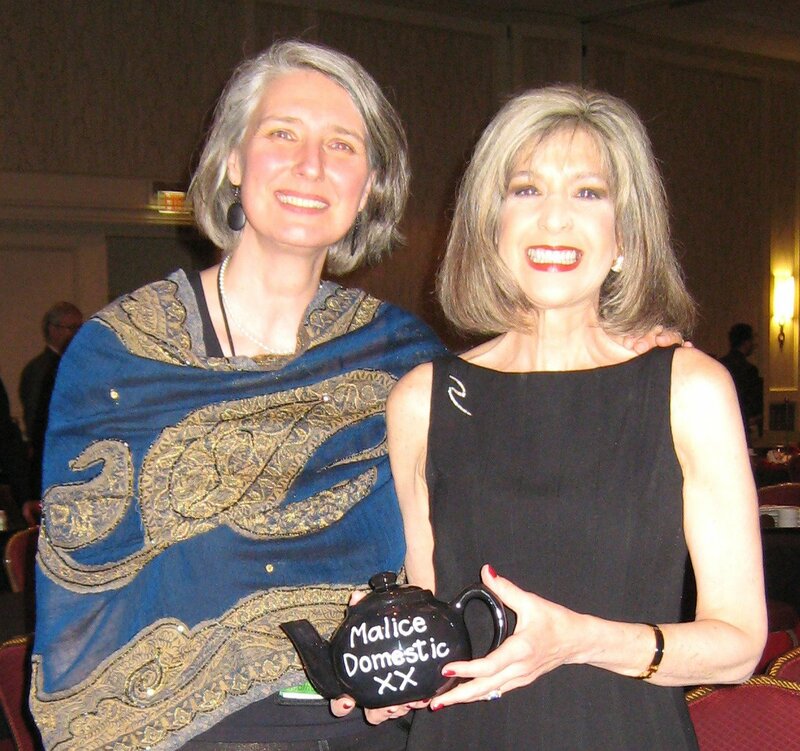 ROBERTA: I've missed Malice the last couple of years, and I miss it! Hallie, thanks for remembering me being up for an award. That was a very exciting year. 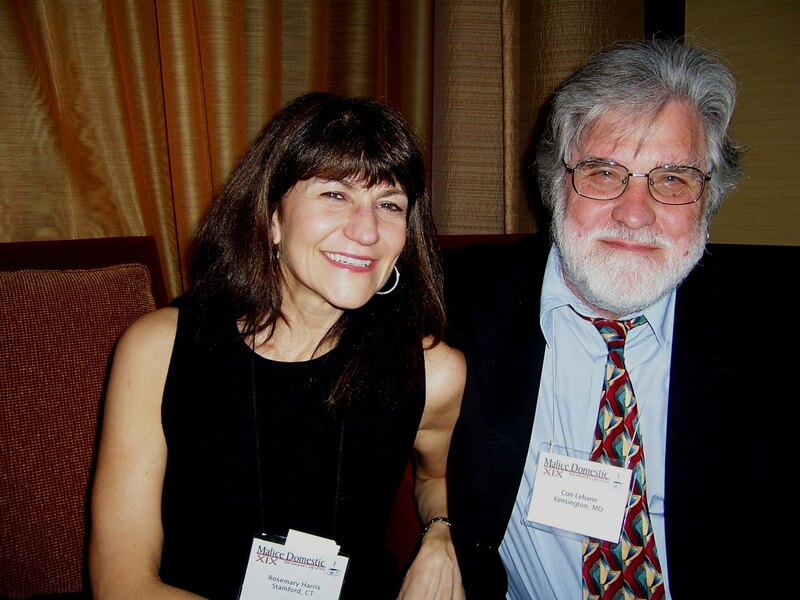 Nothing more thrilling than being interviewed by Margaret Maron in front of a full house! 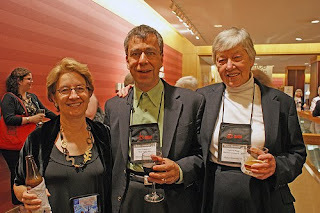 Malice is very much like a big house party--it's not overwhelming the way Bouchercon can be. And Sisters in Crime usually has a big presence so that's always fun. I regret to admit that I've never made it to the tea party with the hats...very hard to pace yourself and still have energy on Sunday afternoon! I'm looking forward to attending next year. Hope the new (old) hotel has a nice big central meeting place. had a book out. But if remember correctly, I actually wrote about the conference for the Providence Journal while I was there. I also think that's when I met Deb the first time. I think we had dinner! DEB: I THINK my first Malice was the year before I was nominated for Best First--oh, my, how time flies. But I certainly know the best thing that happened at that Malice--I met Kate Charles and Marcia Talley, who are still, how-many-ever years later, two of my very best friends. That's one of the great things about Malice, which I've missed for many a year now, as I usually seem to be in England in April. And my second best Malice memory? The year I didn't win Best Novel for Dreaming of the Bones. Tom and Enid Schantz from Rue Morgue in Bolder made me a Rue Morgue Best Novel Teapot, and that is one of my treasures. I keep it on my desk to remind me what good friends I've made in my writing career. HANK: My first Malice? I was terrified. Terrified! Who would I talk to? I was so intimidated. But people were loving and welcoming...and like you,Deb,now some of my dearest friends are from there. Malice memories? I brings tears to my eyes to think about them all. The phone call from dear Louise Leftwich, telling me PRIME TIME was nominated for Best First. I wrote it all down, I was so surprised, and I still have that piece of paper on my fridge. Standing at the podium, misty-eyed and thrilled, worried I would drop the teapot. And I was so happy afterwards, taking photos..but there's not one picture of me alone with the teapot. And I think-that means a lot. SO many more memories! But I don't want to mooch too much space here. And this year..crossing fingers for DRIVE TIME. It's such an honor to be nominated! Who's going? RHYS: I've been a loyal Malice attendee since 1998, and Deb, I can't believe Dreaming of the Bones didn't win! it's one of my favorite mysteries ever. I have lots of memories over the years but those that stand out were winning the Agatha best novel for Murphy's Law. Usually they go through the awards with best novel as the last. That year it was first and suddenly I heard my name called out and my friends doing a happy dance and I'm totally in shock. I didn't even have a chance to prepare my face in a composed "I'm a gracious loser and it's an honor to be nominated" pose. I've had plenty of chance to do that since as I've had seven more nominations and no more wins. My other really special memory was last year when I was toastmaster. I had to work hard, hosting all the ceremonies, but was also treated like a VIP, which was very nice. This year I'm ordinary folks again, except that I am joining Mary Jane Maffini in giving a tribute to our dear friend Lyn Hamilton and accepting an award on her behalf. That will be very hard to do as I still miss her horribly. But that brings me to what others have said. I have met several women who have become close friends at Malice. Always I'm awed by how supportive and generous the other mystery writers are. We are really a super nice bunch. And keeping my fingers crossed for Hank this time! JULIA: Meeting other writers and fans is really what it's all about, isn't it? I'm pretty sure I met most of the Jungle Red Writers at one Malice or another! A lot of my Malice memories revolve around meals: wearing a pinch-waisted outfit that looked fabulous, only to discover after I sat down at the awards banquet that it cut off my circulation below the belt. Or the time the banquet was in a hall next to a LOUD wedding reception, and we were all treated to a live cover of Hall and Oates during the presentations! Meals with friends: Jeff Cohen teasing me over my amazed appreciation of this wonderful new drink, the "Arnold Palmer" (what can I say? I don't get out much...) or walking to lunch with Louise Penny and her husband Michael Whitehead, watching them holding hands as they strolled along the Jeff Davis Highway. 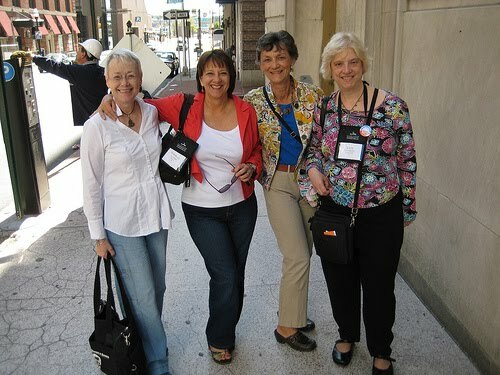 My most treasured Malice memory is falling into an impromptu dinner party with Ruth Cavin and three of her other authors; Donna Andrews, Meredith Cole, and Liz Zelvin. We drank and swapped appetizers and laughed and listen to Ruth's wonderful stories. It wasn't the first time I had a wonderful meal with Ruth, but it would be my last. Malice always features a "Ghost of Honor," and I suspect hers will be there, reveling in all the friendship and fun just as she did in life. You all look wonderful in the pictures. Roberta, nothing wrong with more than one cocktail! I'm going for the first time and am thrilled about it. I'm still recovering from back surgery, so if you see me lying on the floor at the back of the room, don't worry. New Mystery Writer Education 101: My lasting Malice memory involves a line of people that wrapped around the signing room, through the lobby, and into the restaurant. There were 20-30 authors in the signing room but 990 out of one thousand men and women were in line for one person. Who is Charlaine Harris, I asked? Oo, the looks I got. Hey, Jack..I remember getting that same look for Who is Lindsay Davis? Totally revealed myself as a newbie. This seems to be my year for writing workshops and not conferences, but I've always wanted to go to Malice so maybe in 2012. The ego part of me really would like to have a book on its way to publication, y'know? :o) Sounds like a lot of fun though. And the pictures are great! You've reminded me of another Malice memory. Coming into the signing room after my panel and seeing a long line at one table and trying to see who was getting all those people and then realizing with a flood of bewilderment that they were waiting for me! And an afterthought. My capcha word is bakee. As in the Gingerbread man, I suppose. I was SO hoping to get to Malice this year!!!! I've never been. NEXT YEAR! for sure. But I will have my fingers and toes crossed for our Hank. Deb - I LOVE this picture of us! I remember walking down the street in Baltimore during B'Con (my first) with my buddy Shane Gericke and seeing you and Kate and Marcia and thought I would melt right into my shoes. I can spell, as in BOULDER! Julia, I think we met at that 1998 Malice! And Kaye, I love that picture, too. And even though it's B'con and not Malice, it's all in the same spirit! We miss you Jula, Jan, Roberta, Hallie, and Deb! You know you're welcome at our "family reunion" anytime, as this is one of those families you can never, ever get out of. It's going to a be a good party this year! Malice is on my bucket list. 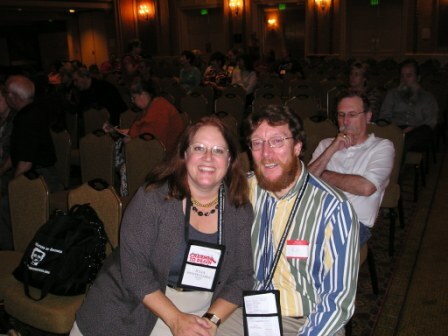 It was Bouchercon, until Julie Hyzy told me how much fun and how much less overwhelming Malice is. Dru Ann Love got to go last year, and I've been insanely jealous (kidding, Dru Ann!) This year a new granddaughter trumped Malice, but next year...ah, next year! I want to meet all of you and the rest of my Facebook author crew! Joni, we must conspire to get all the Reds to come next year..wouldn't that be great? This will be my second Malice and I can't wait. 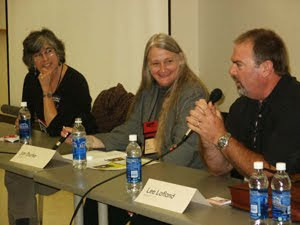 I had a ball last year meeting all the authors that I read and love. Some have become friends and I can't wait to make new ones. My favorite memory was all the authors that approached me saying my name and knowing me because of my participation on their blog. Shel, you'll be there in 2012. I'm going to my first Malice this year, and I'm very excited. I'll be crossing fingers and hooting for you, Hank!